Description: Sometimes described as a “feathered mouse,” this is the smallest of the shorebirds. In all plumages, it is browner than other calidrine sandpipers and has short, dull greenish-yellow to bright yellow legs and a black, somewhat downcurved bill. In breeding plumage, a thin white “V” may be apparent on the mantle. They are often seen feeding in a “scrunched-down” position in the upper vegetated portions along the edges of wetlands, rather than on open mudflats with other calidrine sandpipers. Similar Species: Like other “peeps” (the small, confusing Calidris sandpipers), Least Sandpipers can be difficult to distinguish. However, their yellow legs, small size and overall browner coloration help single them out from larger sandpipers. 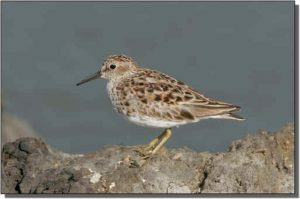 Comments: Relatively common throughout North America, Least Sandpipers are often encountered while looking for shorebirds. They breed in a broad band throughout the subarctic and boreal regions of northern North America and winter in northern South America.